"St Kevin" redirects here. For Patron saint of the island of Inisheer, see Caomhán of Inisheer. 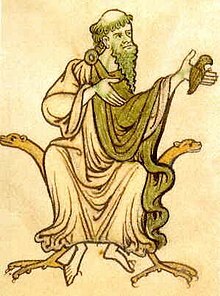 Saint Kevin (modern Irish Caoimhín; Old Irish Cóemgen, Caemgen; latinized Coemgenus; 498 (reputedly)–3 June 618) is an Irish saint, known as the founder and first abbot of Glendalough in County Wicklow, Ireland. His feast day is 3 June. His life is not well documented, as no contemporaneous material survives. There is a late medieval Latin Vita, preserved among the records of the Franciscan Convent in Dublin, edited by John Colgan as part of the Acta Sanctorum Hiberniae. According to this account, Kevin (like St. Columba) was of noble birth, the son of Coemlog and Coemell of Leinster. This account stated he was born in 498 AD at the Fort of the White Fountain and baptized by Saint Cronan of Roscrea. His given name Coemgen (anglicized Kevin) means "fair-begotten", or "of noble birth". A tradition cited in the 17th century makes Kevin the pupil of Saint Petroc of Cornwall, who had come to Leinster about 492. This tradition is not found in the extant late medieval and early modern hagiography of the saint and appears to be based in a Vita breviora which the Bollandist editors obtained from Henry Fitzsimon, but which is no longer extant. The Vita also contains a number of legends, which according to Colgan's co-editor Francis Baert are of "doubtful veracity" but were kept in the 17th-century edition for as they were assumed to date still to the medieval period. For example, the text includes an infancy legend involving a white cow said to have come to his parents' house every morning and evening and supplied the milk for the baby. Glendalough, or the Glen of two Lakes, is one of the most important sites of monastic ruins in Ireland. Before the arrival of St. Kevin this glen would have been desolate and remote, and would have been ideal for a secluded retreat. Kevin was ordained by Bishop Lugidus and, following his ordination, he moved on to Glendalough in order to avoid the company of his followers. He lived as a hermit in a cave (a Bronze Age tomb now known as St. Kevin's Bed), to which he was led, in the account of the Vita, by an angel. St. Kevin's Bed can best be described as a man-made cave cut in the rock face very close to the edge of the mountain. It overlooks the upper lake from a height of about 30 feet (10 metres). The approach to the cave is very difficult, with access to it through a rectangular space and a short passageway 3 ft. (1 metre) high and 2½ ft. wide. The inner or main part of the cave is just 4 ft. wide (1.5 metres) and less than 3 ft.(1 metre) high. It is reasonable to assume that the cave could only have been used as a sleeping place, and would have been impossible for an adult to stand upright in, so it is quite likely that St Kevin only used it as his bed, or a place for pious prayer or meditation. Dr. Leask expresses the opinion that this cave was constructed long before Kevin's time and it was probably the first and oldest piece of work to be undertaken by man in the glen. There is a legend which claims that St Laurence O'Toole used the "bed" as he frequently made penitential visits to Glendalough, especially during the season of Lent. Michael Dwyer, the famous Wicklow rebel, is reputed to have taken shelter in the "bed" while he was on the run from British soldiers. The story goes that he escaped capture one morning by diving into the lake and swimming to the opposite side. Today, it is highly dangerous to try to approach the "bed" from the side of Lugduff mountain. Visitors, in the interests of their own safety, should be content with a distant view of it. Kevin lived the life of a hermit there with an extraordinary closeness to nature. His companions were the animals and birds all around him. He lived as a hermit for seven years wearing only animal skins, sleeping on stones and eating very sparingly. He went barefoot, and spent his time in prayer. Disciples were soon attracted to Kevin and a further settlement enclosed by a wall, called Kevin's Cell, was established nearer the lakeshore. By 540 Saint Kevin's fame as a teacher and holy man had spread far and wide. Many people came to seek his help and guidance. In time Glendalough grew into a renowned seminary of saints and scholars and the parent of several other monasteries. In 544 Kevin went to the Hill of Uisneach in County Westmeath to visit the holy abbots, Sts. Columba, Comgall and Cannich. He then proceeded to Clonmacnoise, where St. Cieran had died 3 days before. Having firmly established his community, he retired into solitude for four years, and only returned to Glendalough at the earnest entreaty of his monks. Until his death around 618 Kevin presided over his monastery in Glendalough, living his life by fasting, praying and teaching. St Kevin is one of the patron saints of the diocese of Dublin. He belonged to the second order of Irish saints. 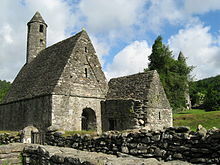 Eventually, Glendalough, with its seven churches, became one of the chief pilgrimage destinations in Ireland. St. Kevin's Church, with the Round Tower of Glendalough in the background. Kevin of Glendalough was canonized by Pope Pius X on 9 December 1903 (cultus confirmation). One of the most widely known poems of the Nobel prizewinner Seamus Heaney, 'St Kevin and the Blackbird', relates the story of Kevin holding out his hand with trance-like stillness while a blackbird builds a nest in it, lays eggs, the eggs hatch and the chicks fledge. A series of paintings by the Welsh artist Clive Hicks-Jenkins around 2009 depicted the story of Kevin and the blackbird, by way of Heaney's poem. Kevin is remembered in popular culture as an ascetic. This is commemorated in a folk song about him which describes a legend claiming that he drowned a woman who attempted to seduce him. This was recorded and made popular by the Dubliners. [year needed] The opening verse is as follows: "In Glendalogh there lived an auld saint, renowned for his learning and piety, his manners were curious and quaint, and he looked upon girls with disparity." The independent film-maker Kevin Smith refers irreverently to his namesake 'Saint Kevin' and the key events of his life in the introduction to Sold Out: A Threevening with Kevin Smith, his 2008 live Q & A show. Kevin is referenced several times in Finnegans Wake by James Joyce. The longest episode is found in Pt IV, pgs 604–607 (Faber & Faber, Viking editions) It was one of the earliest drafted "vignettes" and much revised before final publication. ^ "Saint Kevin". Encyclopædia Britannica. ^ John O'Hanlon, Lives of the Irish Saints vol. 6 (1873), p. 51. ^ Karen Jankulak, The Medieval Cult of St Petroc (2000), p. 16. ^ "that although many of the legends given to this work are of doubtful veracity; it was decided to let them stand in favour of the antiquity of the document which is placed as having been written during or before the 12th century". [page needed] cited after glendalough.connect.ie. ^ Heaney, Seamus, The Spirit Level (London: Faber and Faber, 1996), pp20-1. Latin vita of St Kevin, ed. Charles Plummer, "Vita Sancti Coemgeni (Life of St. Kevin)." In Vitae Sanctorum Hiberniae. Vol. 1. Oxford: Clarendon Press, 1910. 234–57. Irish vita of St Kevin, ed. Charles Plummer, "Betha Caimgin (Life of St. Kevin)." In Bethada Nóem nÉrenn (Live of Irish Saints). Oxford: Clarendon Press, 1922. Vol. 1: 125–67 and vol. 2: 121–61. Edition available from CELT. Gerald of Wales, Topographia Hibernica. Barrow, Lennox. Glendalough and Saint Kevin. Dundalk: Dundalgan Press, 1972. MacShamhrain, A.S. "The 'unity' of Cóemgen and Ciarán. A convent between Glendalough and Clonmacnoise in the tenth to eleventh centuries." In Wicklow: history and society: interdisciplinary essays on the history of an Irish county, ed. by Ken Hannigan and William Nolan. Dublin: Geography Publications, 1994. 139-50. "Kevin". Patron Saints Index. Archived from the original on 10 December 2007. Retrieved 5 December 2007. This page was last edited on 15 April 2019, at 21:14 (UTC).